I’m afraid that I have to begin with saying that I have a huge problem with the Tender app. I want to eat pretty much everything I see (and I say this having just finished a delicious lunch of penne and homemade pesto, so hunger can’t be blamed). As problems go, I’ll live with this one. It’s simple, really. 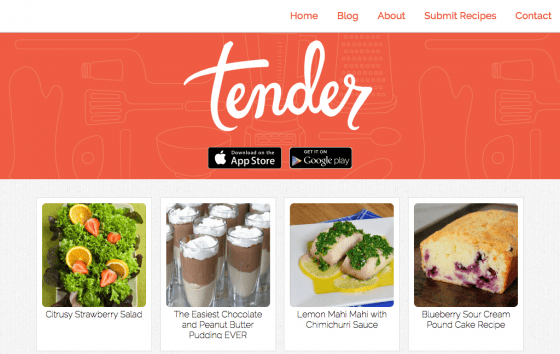 The Tender app puts a lot of attractive dishes in front of your eyes. A simple swipe lets you discard or save the plates you like. So, it’s also fast. You can save recipes to your cookbook if you like. You can also set up easy filters to target particular plates. These features are useful and, no doubt, probably mandatory for this kind of discovery app. I gotta tell ya though, as the parent of a one-year-old boy, I’m drawn to the speed. Friends (myself included) have a hard time recognizing me these days. I have no memory or patience or energy or much concern about what I eat. And I love to eat well. So Tender scores high marks with me because I can open it up and immediately find abundant inspiration, and easy-to-follow instructions if I so happen to be in a moment where I can cook. Hello, “Fiery Chili Cheese Casserole,” “Fresh Tomato Biscuits,” and “Pear Cobbler.” I see you, and I’m going to enjoy you for dinner. Now. Stick a fork in the Tender app at tender.li or download the app from either the App Store or Google Play.